Mexico is the world’s largest producer and exporter of avocados. The avocado harvest for the 2013/14 season was close to 1.5 million metric tons, a new record. More than 90% of Mexico’s avocados are grown in the state of Michoacán, where 12% of all agricultural land is currently under avocado orchards. Mexico produces about 1.5 million metric tons of avocados a year, on 170,000 hectares in 27 states. 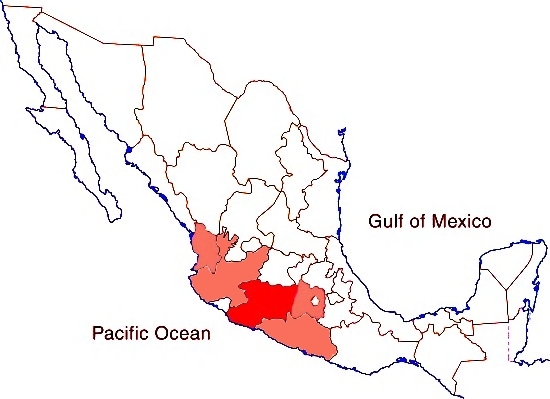 The principal producing states are Michoacán 1.2 million tons, Jalisco 87,000; State of México 56,000; Nayarit 34,000; Morelos 27,000; Guerrero 14,000. Avocado exports have risen sharply and, in the first half of 2014, totaled 353,000 metric tons, worth 800 million dollars, 29% higher than for the same period a year earlier. The most important markets for Mexican avocados are the U.S., Japan, Canada, Central America and Europe, but demand for avocados in Asia, especially China, is rising very quickly. Exports to China rose 724% for the period to 1,260 metric tons, worth 3 million dollars. Exports to the USA of avocados were worth 651 million dollars, 31% higher than a year ago; exports to Japan reached 62 million dollars, up 29%; and to Canada 41 million dollars, up 33%.